It’s time for some mobile privacy! I am sure that not even one person in a thousand has ever attempted to manage web browser cookies on the PC. I have to admit that I’ve been one of those 999 until recently. However, leaving the browser on its own to collect and send cookies as requested by web sites leaves the door wide open to advertisment companies and other institutions who love nothing more than to spy on where users are going in the web and what they are looking at. So I’ve set my cookie options in Firefox to only allow cookies from a few select web sites so I don’t have to log in everytime I go there. All other cookies are automatically deleted whenever I close the browser. In the mobile world I would like to do the same thing. However, Opera for S60 has only very limited cookie privacy options. One can either delete all or none. Not good for me as I would like to keep some cookies like for example the one that keeps me logged into my mobile Flickr account. Time for some action Opera! 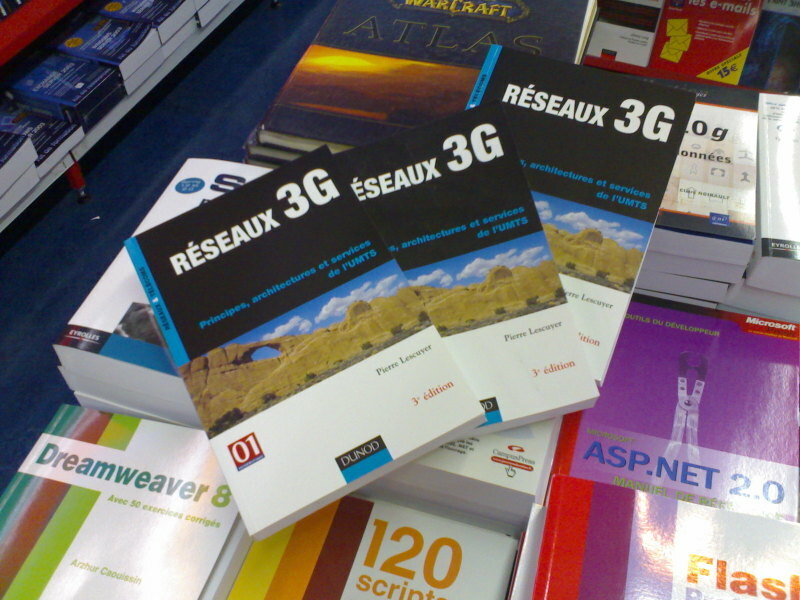 Silently, my fellow co-worker Pierre Lescuyer has updated his excellent book on UMTS called "Réseaux 3G" (3G networks) and the 3rd edition is now available in French. 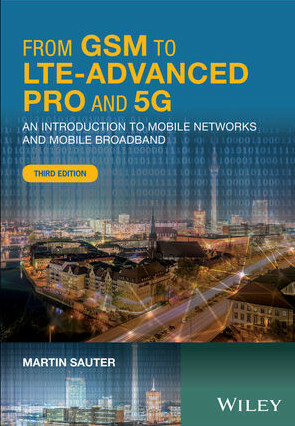 The new edition contains among other additions new chapters on HSDPA, HSUPA, IMS and MMS. Previous editions are also available in English and German. Very well done, Pierre, congratulations! 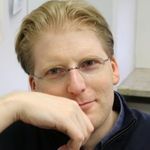 Again a great summary of this week’s best blog entries on wireless in the Carnival of the Mobilists. This week the Carnival is hosted at the Digital Evangelists blog, so head over and check it out! A 10 MHz FDD LTE channel is split into 600 sub-carriers. X2 Handovers are performed directly between two eNodeBs while an S1 handover requires the help of the MME. S1 handovers are only used when two eNodeBs are unable to communicate with each other which should happen rarely in practice. The MME performs the subscriber and connection management such as user authentication, location management, bearer establishment, etc. while the Serving-Gateway handles the user data (i.e. the IP packets) that are exchanged between a device and the Internet. 7 symbols on the time axis and 12 sub-carriers on the frequency access are grouped into a Resource Block which takes 0.5 ms to transmit. Two Resource Blocks are bundled together to form the smallest unit that can be scheduled to a user. If the UE is in Idle state it has to use the random access channel to establish a connection to the network. When the network receives the request it assigns uplink resources to the device via the Physical Downlink Control Channel (PDCCH). The UE receives the assignment and can then make use of the assigned resources on the Physical Uplink Shared channel. HARQ is a mechanism on Layer 2 of the radio protocol stack and ensures that faulty resource blocks are immediately retransmitted. ARQ works on the RLC layer further up in the protocol stack and ensures that larger chunks of data are repeated in case HARQ fails. While HARQ is always used, ARQ is not used for voice bearers (only IMS VoIP) as there is no time to retransmit complete VoIP packages due to the requirement to have low jitter and delay values for voice packets. For VoIP it is preferable to drop missing packets instead of repeating them. A default bearer is usually assigned when the device is switched on. It serves as a bearer for Internet connectivity. A device can have several default bearer simultaneously, e.g. one for Internet connectivity and one bearer for IMS. In practice, devices usually only have one default bearer. Dedicated bearers are established by services alongside default bearers such as the IMS to ensure a certain quality of service (minimal bandwidth, jitter, delay, precedence over other bearers) for voice, video and other time critical and delay sensitive streams. Discontinuous Reception (and Transmission) is very useful in RRC connected state to reduce power consumption. Without DRX a UE has to observe the Downlink Control Channel frequently as resources could be assigned at any time. When DRX is activated the UE can turn off the receiver most of the time and only listen occasionally. This significantly reduces power consumption at the expense of slightly higher latency when data is only transmitted infrequently. Typical DRX values are a few hundred milliseconds for the activation time for DRX (after the reception of the last data frame) and activity times of a few milliseconds during an interval of several hundred milliseconds. In Idle state no bearer is established to the network and the UE controls cell changes and changes to other radio networks when running out of LTE coverage autonomously. When running out of LTE coverage there are several methods to guide the UE to another radio network (e.g. UMTS). An easy solution is to use a Cell Change Order which tells the UE to which UMTS cell to go. The connection is then interrupted and the UE searches the given cell, reads the system information and performs the required procedure to establish a connection in the other radio technology. This process typically takes a few seconds during which no data can be exchanged. This method is simple for implementing in the network and the mobile device but not suitable for applications such as VoLTE, for which the data bearer should be handed over between radio networks quickly. This is possible with LTE to UMTS (or GSM) handovers as the cell in the target network can be prepared for the incoming UE. The UE is then given specific instructions of how the target cell can be accessed which reduces the outage time to a few hundred milliseconds. MME and S-GWs usually have the Gn GPRS interface implemented and can thus act as SGSNs and GGSNs towards 2G/3G PS core network equipment. In other words, they emulate behavior those network nodes understand so no software modifications are required in existing networks. It should be noted that in practice today, most network operators have merged corresponding 2G, 3G and LTE core networks into a single physical node and the interfaces between the logical components are handled internally. This is done via the SGs interface which connects the MME to Mobile Switching Centers in the 2G/3G networks to deliver SMS over LTE and to perform a (CS = circuit switched) fallback to GSM or UMTS for incoming (and outgoing) voice calls. Internet based voice services can not request special quality of service settings from the mobile core and access network (i.e. dedicated bearers, see above). Depending on the network load this can result in bad voice quality if voice packets are not preferred over other packets (e.g. from web browsing from the same or another UE) in loaded cells. Also, Internet based VoIP services can’t interact with the mobile network to perform handover to GSM or a circuit switched UMTS channel when the edge of a broadband wireless network has been reached. Operator voice services can hand over a call to GSM (Single Radio Voice Call Continuity). eNodeBs have to have a high speed link to the core network to accommodate the high speed air interface data traffic. The best option is to use a fiber optic cable. If not available, other options are Ethernet based microwave links or VDSL links. The main components of the IMS are the Serving Call Session Control Function (S-CSCF) that is the central node that handles all SIP messages. Usually, SIP messages are forwarded to an Application Server (AS) such as the Telephony Application Server that implements telephony functionality. The Proxy-CSCF sits between the S-CSCF and the mobile device and is used for tasks such as generating SIP messages for the UE when the UE is unable to do so (e.g. loss of coverage). The Interrogating CSCF (I-CSCF) is contacted when the UE sends an initial Register. It contacts the HSS (Home Subscriber Server) to get information on the user and then assignes a S-CSCF that will handle all subsequent communication. During SIP registration an IPSec tunnel is established between the UE and P-CSCF. While encryption is optional, IPSec authentication ensures that only messages from the UE are accepted. Preconditions are used to inform devices that a dedicated bearer has to be established for the speech path on one or both ends of a connection before a call can be further processed. In the core network, precondition messaging is used to trigger the establishment of the dedicated bearer. The P-CSCF, which is a mobile network component, inserts the ‘asserted identity’, which is the device’s phone number (MSISDN), into SIP messages sent by the UE and then forwards those enriched SIP messages to the S-CSCF. This prevents the UE from forging its phone number. As the payload of voice packets are small the IP, UDP, RTP header information makes up a large part of the overall packet. Therefore, header compression is used to significantly reduce this overhead which increases the number of simultaneous calls per cell. Call forwarding settings are managed via the XCAP protocol between the UE and the network. XCAP is an XML protocol and different call forwarding options such all call forward no reply, call forward not reachable, etc. are XML encoded. For emergency calls an IMS emergency bearer is established that is independent from the standard IMS bearer that is used for ordinary voice calls. The IMS emergency bearer is established with the highest priority in the radio and core network to guarantee emergency calls a high quality speech and signaling path even in fully loaded networks. Unlike typical handovers that are controlled by the network, VoLTE to VoWifi handovers are controlled by the mobile device. When the device senses that LTE coverage is about to be lost, it establishes an IPSec tunnel to the evolved Packet Data Gateway (ePDG) and includes information during the tunnel establishment that allows the network to move the existing IMS bearer away from the current MME and S-GW to the ePDG. All IP packets of the connection are then automatically redirected to the ePDG and an ongoing voice call continues with only a short interruption during the redirection process. VoWifi cellular preferred means that the UE will only connect to the ePDG and move the IMS bearer when no cellular coverage (LTE, 3G, 2G) is available. VoWifi Wifi preferred means that the IMS bearer is moved to Wifi as soon as a suitable Wifi connection is available. MC-PTT only allows one person in a communication group to speak at a time. A central instance is required to control who is allowed to talk and deny requests from other parties if there is already another speaker in the call. Devices communicating in an Ad-Hoc network exchange their data directly with each other. There is no central point in the network, all devices are equal. This mode is used if no WLAN Access Point is available and data needs to be exchanged between two or more devices. The disadvantage of this mode is that each device has to be configured manually. This includes the IP configuration and wireless LAN settings like for example encryption. In the BSS (Basic Service Set) mode on the other hand, an access point is used. Data is not exchanged directly between client devices. Instead each data packet is first sent to the access point and from there to the final destination. This has the disadvantage that the maximum speed is cut in half compared to an Ad-hoc network. The advantage on the other hand, is an increased coverage area of the network, as distant devices can still communicate with each other because they are still in range of the access point. In addition, the access point usually contains a DHCP server which automatically configures the IP stack of other devices in the network when they first register. Furthermore, the access point usually also acts as a bridge to a fixed line network (e.g. the Internet) and fixed line Ethernet client devices. A wireless LAN access point is usually equipped with a DHCP server to automatically configure end user devices. In addition, an Access Point is usually also equipped with one or more Ethernet sockets for fixed line Ethernet devices (bridging functionality). Furthermore, many access points act as routers for cable- or DSL modems or even include this functionality. Thus, only a single device is needed to connect fixed and wireless devices with each other and the Internet. In an Extended Service Set (ESS), several access points are used which are interconnected via an Ethernet cable (distribution system). All Access Points broadcast the same SSID which enables wireless clients to roam between them. This way, the coverage area of the wireless network can be increased. The SSID is the Service Set ID and is used by client devices to identify a wireless network. This way, several independent wireless networks can be operated at a single location. The user typically configures a device by entering the SSID which is then stored in the configuration. Thus, the device automatically remembers which network it should attach to when it is switched on again. The SSID is broadcast in beacon frames which the access point broadcasts several times a second. A mobile device can use the power save mode in order to conserve energy while no data is transferred. In order to enter this mode an empty frame has to be sent by the mobile device to the access point, which has the power save bit set to ‘1’ in the header of the frame. Afterwards, the mobile device deactivates its transceiver in order to conserve energy. The access point in turn starts to buffer incoming packets for the device, should there be any during its sleep period. From time to time, the device activates its transceiver again to check the Traffic Indication Map (TIM) which is included in a beacon frame to see if there is incoming data waiting to be delivered. If there is no data, the transceiver is deactivated again and the TIM is checked again after the next sleep period. In case data is available, the mobile device exits the sleep mode and polls the access point for the queued frames. Acknowledgement frames are used as transmission on the air interface is much more volatile then over cables. By sending an acknowledgement frame the receiver informs the sender that the packet was received correctly. If no acknowledgement frame is sent or if it is lost the frame is automatically retransmitted. The 802.11g standard uses the RTS/CTS mechanism as older 802.11b devices are unable to detect frames which have been sent by using the new modulation and coding schemes offered by the ‘g’ standard. This ensures that older devices do not perceive the channel as free when a frame with an unknown modulation and coding scheme is in the process of being sent. In addition, the RTS/CTS mechanism is also used to avoid the ‘hidden-station’ problem. First address: sender, second address: receiver, third address: MAC address of the access point. This is required as a frame is not delivered directly to the destination in a BSS setup but always via the access point. The PLCP header of a WLAN frame is always sent at a data rate of 1 MBit/s. This ensures that even distant devices are able to receive this part of the frame correctly. The PLCP header also contains information on the transfer speed, the modulation and the channel coding used for the main part of the frame. The theoretical top speed of an 802.11g network is 54 MBit/s. As the frame headers are always sent at a speed of 1 MBit/s, however, the actual top speed is lower. Furthermore, all frames have to pass through the access point which cuts the speed in half if both sender and receiver of a frame are wireless devices. In addition, all frames have to be acknowledged which further reduces the speed. Thus, the top speed that can be achieved between two wireless devices in an 802.11g network is around 12 Mbit/s. The Distributed Coordination Function (DCF) is a decentralized approach to control access to the air interface. Collisions on the air interface are seldom but possible as there is no central instance. Furthermore, such an approach is also not able to ensure a certain access time to the air interface and delay. Applications such as Voice over IP, however, highly depend on constant delay times. While a WLAN network is only lightly loaded, this approach is less of a problem. In highly loaded networks on the other hand, voice quality can be degraded. One of the weaknesses of the WEP encryption algorithm is the use of the same key for all devices. As the key has to be distributed to all users of the network, potential intruders may have the possibility steal the password. Furthermore, certain parts of the encrypted payload header of each frame are known as it is identical in each frame. In combination with the variant of the RC-4 algorithm used for encrypting the frame, this fact can be exploited to break the encryption by collecting a high number of frames and then applying this knowledge on them. A rough estimation shows that an attacker has to collect about 1.5 GByte of data to be able to break the WEP key.